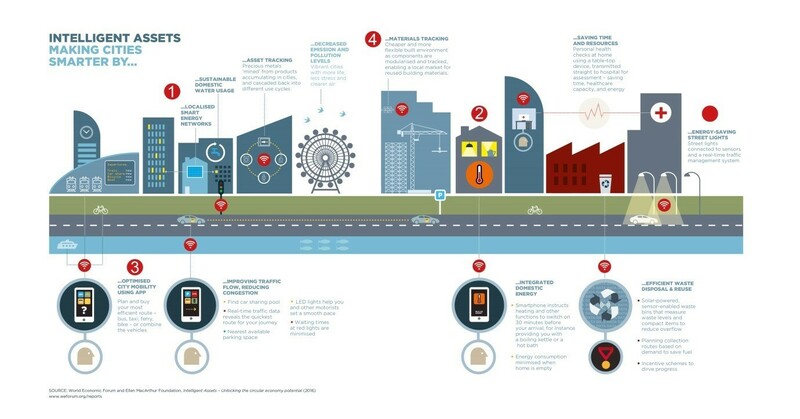 Technology and the internet of things will drastically change the way our cities function. What will it be like to live in them? As demonstrated in a new report, the rapid and pervasive development of digital technologies, along with an understanding of circular economy principles, will drastically change life for the average urban citizen much sooner than we think. The circular economy is a concept by which materials and products are kept at their highest possible value at all times. Finite materials are not thrown into landfills and valuable assets from cars and office space to spare rooms and sporting equipment are not left idle. The rise of the Internet of Things (IoT) will help this to become a reality. Sensors and smart phones will be able to track materials and assets, letting people know when they are not being used, about to break, or where they are. This will unlock huge amounts of spare capacity in the system, creating new business models that will drastically change the way the city functions. The digital circular city would not only save resources but would change the citizen’s experience for the better. What would life in the connected city look like? Your power supply could look very different. Current grid systems are relatively inefficient, long distance energy transmission from centralized power plants can lead to losses of up to 30%. In the future the IoT could lead to a distributed energy network. Households, factories and public buildings will generate their own electricity from renewable sources, using the excess space in walls, roofs and even windows for solar and wind generation. These connected devices will then store any excess energy in various batteries, including the ones in cars or homes – these distributed energy systems could reduce electricity bills by up to 25%. All energy-generating entities will be connected through a grid, allowing them not only to be self-sufficient, but also to contribute to the supply stability of the whole region. Smart sensors will monitor the condition of these capital intensive assets, so that they can be easily maintained, anticipating failures before they happen and making the electricity system even more cost efficient. On walking out the door of your home, smart thermostats will trigger the heating in the apartment to turn down to a minimum, saving energy (and lowering bills). 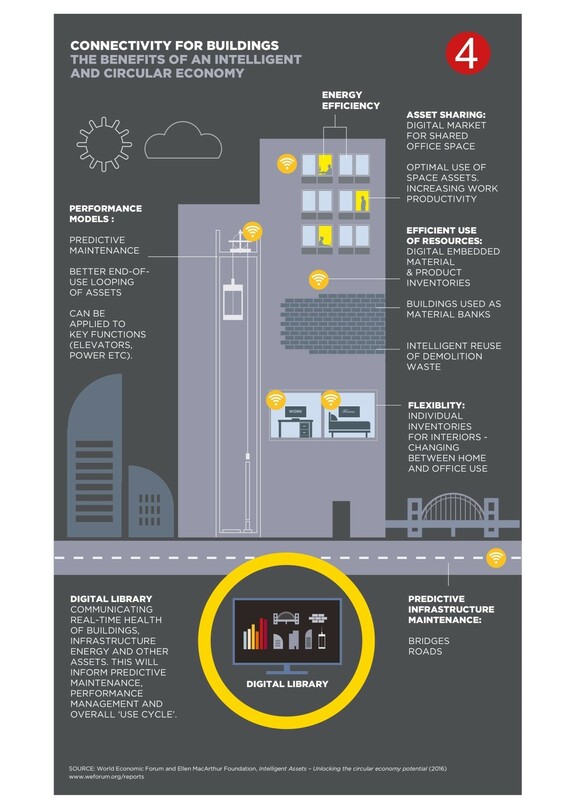 Citizens could make even better use of their assets by converting an extra room into a secure office, rentable on a city-wide sharing platform. Should someone want to rent it on a given day, the heating will quickly power up in time for the temporary resident to feel comfortable and welcome. Demand is likely to be strong - the connected city will have more remote workers and contractors who would appreciate the quiet space. As you leave home, getting to work would be a far less stressful experience. Today the average city dweller spends 15% of driving time in congestion and 20% looking for a parking space. In an IoT enabled city, real time traffic data streams, car sharing schemes and mobile parking apps will smooth the experience decreasing road traffic, emissions and time wasted. 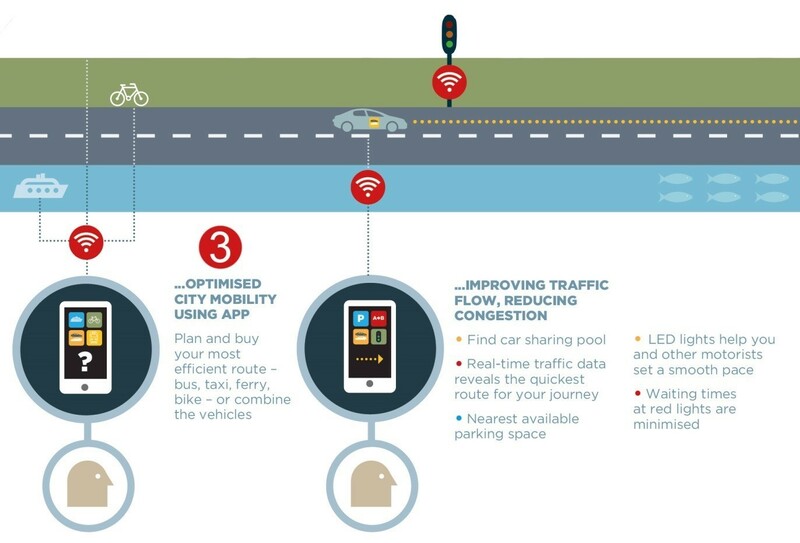 Transport apps will use real time traffic and public transport data to offer citizens the quickest route to their destination by bike, train, self-driving car or bus. If walking turns out to be the quickest route then smart street lamps would increase their luminosity as you draw closer and decrease as you walk away, saving huge amounts of energy without compromising on public security. As you walk into your office complex you are likely to have your desk assigned to you based on who you’re meeting with and your personal preferences. When you leave work at the end of the day the office space around you could be converted into a social/networking event space. Developers will have planned out the space from its inception so that it is flexible enough to accommodate a variety of activities, not just desk work, maximising the value of urban space. Flexibility would not be the only design consideration in a circular city. Whole buildings would be designed as ‘resource banks’. Tracking technologies and material passports could easily record exactly what materials were used to construct the building. All the assets in your office building could be effectively reused when the building is decommissioned or refurbished. 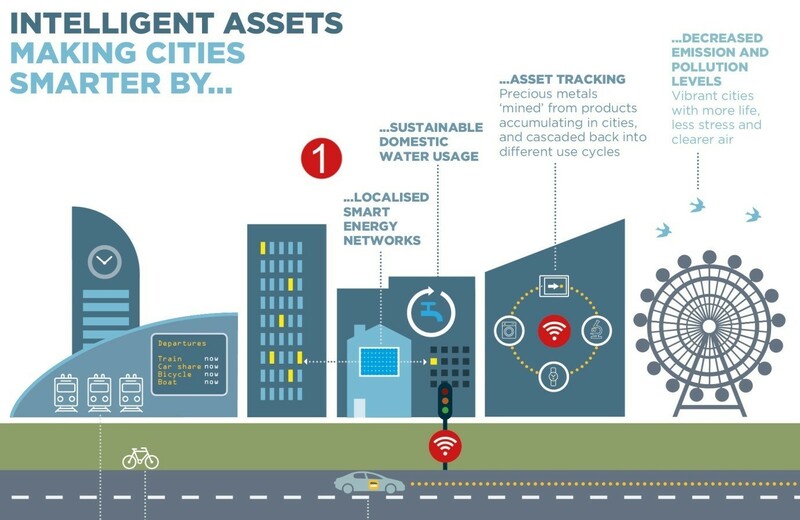 Read Intelligent Assets: Unlocking the circular economy potential. This report was written under the umbrella of Project MainStream, a multi-industry, global initiative launched in 2014 by the World Economic Forum and the Ellen MacArthur Foundation, with McKinsey & Company as knowledge partner, and led by the Chief Executive Officers of nine global companies: Averda, BT, Desso, Royal DSM, Ecolab, Indorama Ventures, Philips, Suez and Veolia.